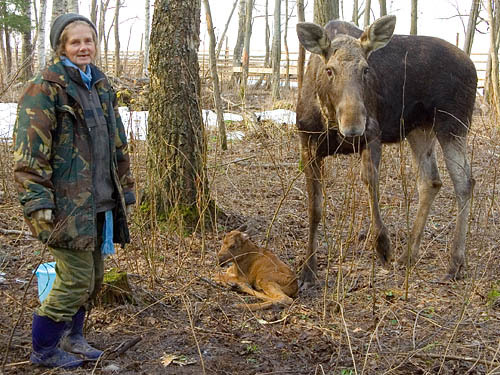 Methods of moose raising and keeping are theoretically founded by employees of P. K. Anokhin scientific research institute of normal physiology, USSR Academy of medical sciences Ekaterina Bogomolova and Yuri Kurochkin. 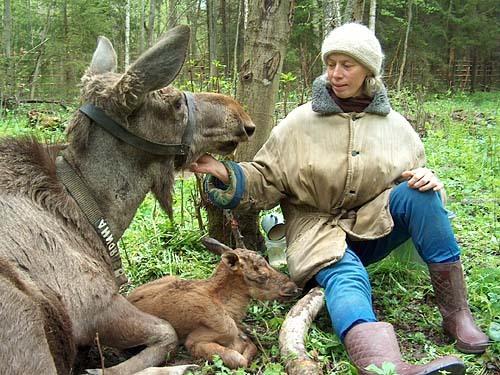 Moose cow and her newborn calf establish a bi-organism functional system (1-3). During the very first stages of its formation, a human intrudes the system, replacing a calf for a cow and a cow for a calf. If the replacement is done in a right way and in time, cow will behave as a mother towards a human almost like she would do towards her calf. She will come to the farm giving milk and defending a human-dairymaid from real and imaginary enemies. The behavior of a calf towards a human will be analogous to his behavior towards his mother. He will follow a human, answer his calls and get milk from a bottle in his hands. The replacement is not complete. 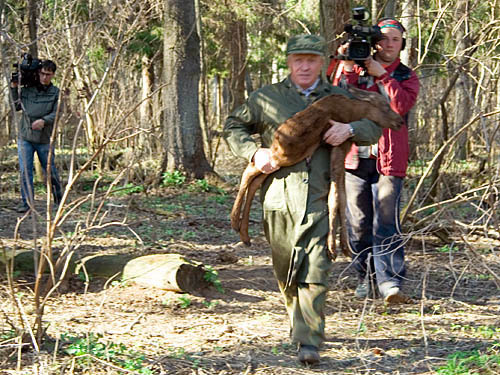 For example, the sexual behavior of hand-reared moose will not be redirected to human. 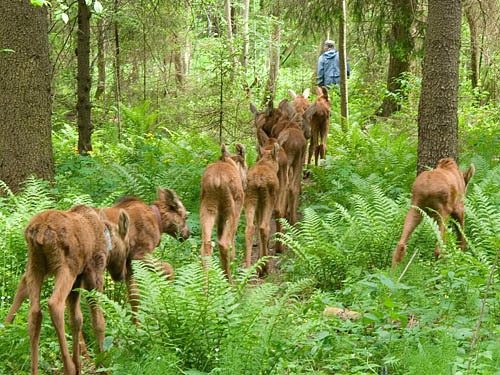 Perhaps, a normal socialization and normal development of a sexual behavior are due to keeping 15-25 young moose together. Some deviations in moose cow behavior towards dairymaid from behavior towards calves are registered, too. I must note, that all the nature laws are «statistical», and if I describe a behavioral reaction, I always imply «as a rule», «usually», «normally»; otherwise attract attention to exceptions. ...or playing lazily to waste time. They begin to worry and look for an exit 2-3 days before labor. Not to miss the initial moments of labor, the farm workers check females every 1-6 hours. It is especially important if a cow is primiparous, i.e. will become a mother for the first time. A dairymaid must appear in time in the birthplace called parturition range. After a while a moose female begins to treat all large objects moving inside the invisible «magic circle» of the parturition range as friends, and those coming from the outside as foes. Thus, she locks the parturition range for intruders. Inside this circle, a cow doesn't attack a small moving object as she does any other time of the year, and so can admit her calf. But she must attack another moose, approaching the parturition range, otherwise a newborn calf who didn't learn to distinguish his mother from other large moving objects, has a chance to follow that object and die without milk. 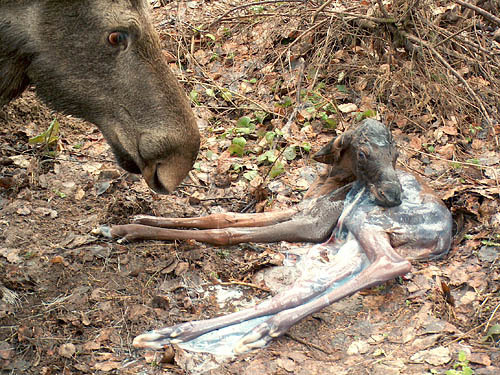 A moose cow treats her last-year (yearlings or two years old) calves as foes, too, and expels them several days before parturition. Nevertheless, for unknown reason, she doesn't regard well-known people including «last-year» dairymaid as foes and, as a rule, doesn't attack them. Moreover, some new workers, and sometimes even an unknown cameraman can enter the parturition range behind them. Every human who enters the circle, must moisten hands with amniotic liquid and let the cow take a sniff. Scent is perhaps the most important sense of moose. Feeling the scent of amniotic liquid together with your own, she will «register» you, maybe as something like her calf. If a cow doesn't give you a command to leave the circle, you may stay and watch the labor. The two photographs in the «Prevention of accidents» section represent a visible command to move away as fast as you can. Every cow will not allow strangers to approach. 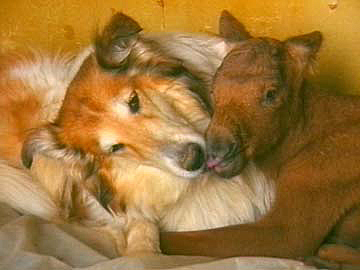 The farm workers obtain more moose love than calves do. 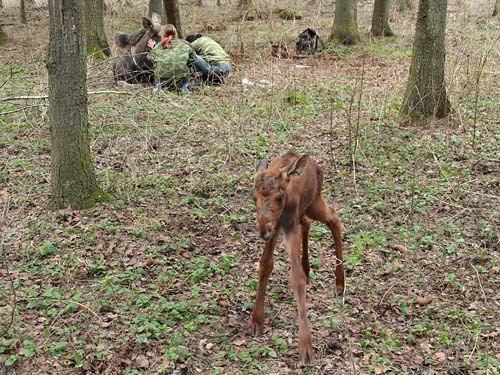 Before the features of moose maternal behavior were discovered, the farm workers used violence to withdraw newborn calves from the parturition place. They put a calf into a basket, covered him with a cloth and pressed to a basket bottom. Repelling the cow with big wooden sticks, they took the basket away through the nearest rail fence. 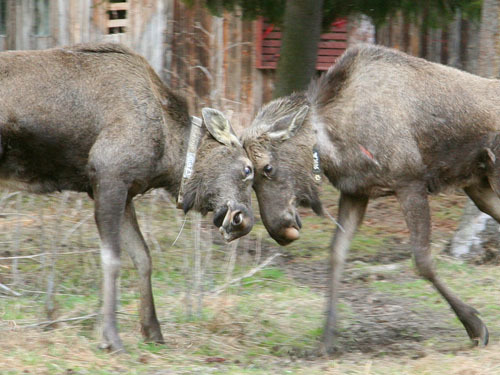 The furious moose tried to beat back an attack, sometimes with success. On the basis of their research, Ekaterina Bogomolova and Yuri Kurochkin gave a suggestion to take calves away without stressing mother. Now we know that a cow remains inside the parturition range and defends it even if no more calves stay with her. To take a calf away, one or two dairywomen distract cow's attention, milking her. A calf has an inherent following reaction and leaves the place following another farm employee. If a following reaction is too weak, it is possible to carry a calf away in hands; moose cow will worry only if a calf cheeps too loud. In their first 4-5 days after birth, both mother and infant react only to few releaser stimuli such as amniotic liquid scent, taste of milk, or cheep of a calf. A mother-infant bond takes 4-5 days to develop (4). 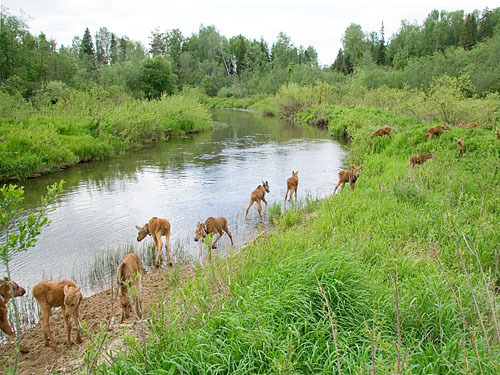 In the nature, mother stays with calves near the parturition place for 4-7 days. Then she defends calves, not the place. On the farm, dairywomen soon become «calves» coming to the parturition place twice or thrice a day. In 1-7 days a cow will come to dairywomen to the milking house herself, and soon dairywomen will release her from the maternity enclosure. If a young mother won't lick her calf – the local Lassie does. In the wild, if a calf was orphaned, premature born, with a low mass under 6 kg, or born during a hard frost, has little chance to survive. Here the attempts of the farm workers will help almost all of them. 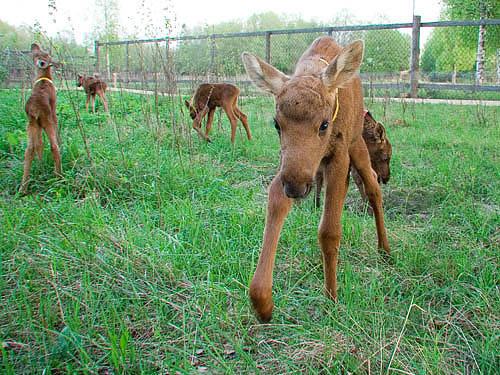 Though veterinary is experienced in healing moose babies, not always is possible to save them. 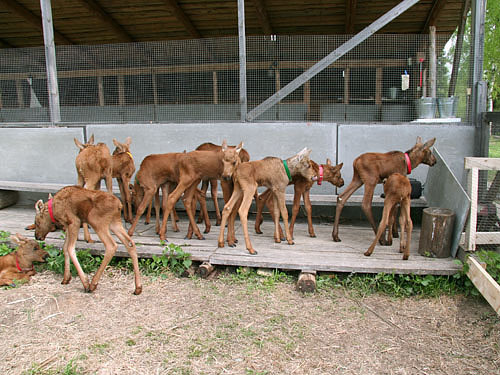 Twenty to thirty moose calves come out during 2 to 3 weeks in late April – mid-May. They will spend about a month in a «quarantine» cage under a shelter and in a fenced walk-yard. Only those who work on the farm may enter the quarantine zone. This will prevent an infection brought by visitors and excess of sweets in calves' ration. During the first week of their lives calves will get milk from a baby-bottle; then they will learn to drink milk from a pan. 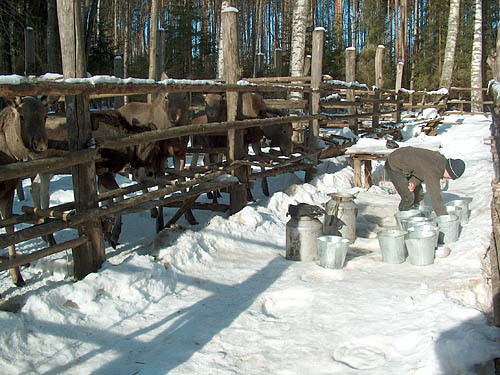 Since second or third week moose milk will be gradually dissolved with and replaced with a milk mixture made especially for them. 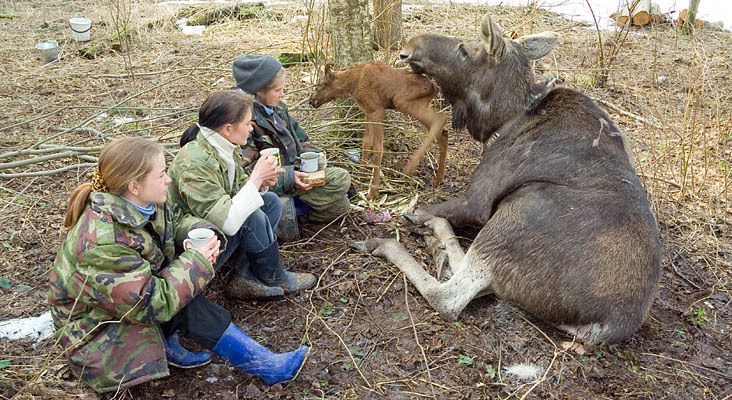 Because moose milk contains high fat and protein, and at the same time low lactose (about 10, 12 and 5%, respectively), neither cow, nor human milk replacers fit to moose bottle-raising. Special foreign milk replacers for wild zoo animals are not available here, but some local manufacturers can make mixtures with a custom ratio. Goat milk is not in use here, but in rescue centers for orphaned calves it can become a good replacer. Willow twigs, meadow grass are given in abundance. Since a first day of a first calf buckets with cooled boiled water, pure soil (clay) and saltlick bricks with mineral additives are available to them. 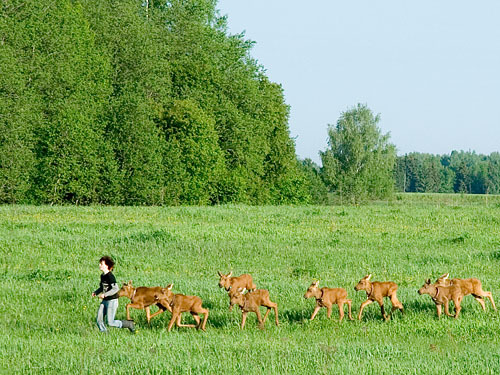 In the early June, when almost every calf reaches 30 days – double march to the summer camp! 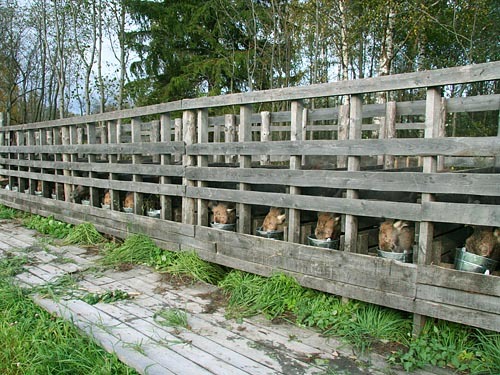 Now the calves will be confined since 10 till 15 o'clock, an excursion time period. After the last excursion, calves get their last today's portion of milk replacer and walk to their free pastures. They are left to themselves, can find and eat all necessary plants. In the early morning breeders will call them to drink some «milk» again. In October calves gain mass up to 100 kg, cast their red coats. 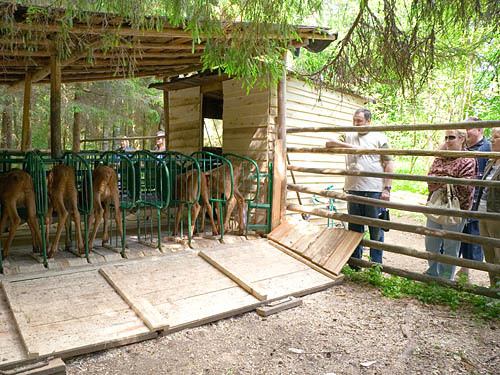 Now they will come to another enclosure situated near the «bar» to drink milk mixture – instead of the summer camp. The local roads become hardly passable in the autumn, and tourists will see all in one place. 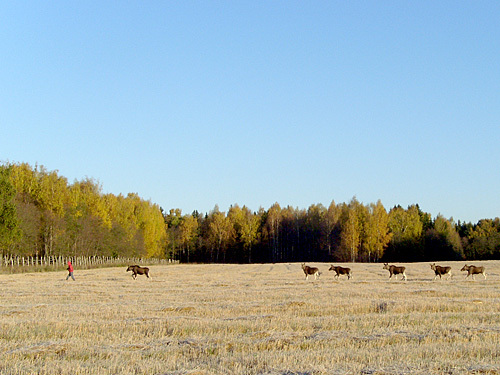 Calves easily walk a couple of kilometers to their chosen pastures. Even if a recidivism of «controlled grazing» occurs, i.e. the command to lead calves to a certain pasture is given, calves go there, but next morning we see them running «for oatmeals» from the place of their own choice. The milk mixture is gradually replaced with oatmeal which is made of ground oats stirred in a hot water with a small amount of salt. 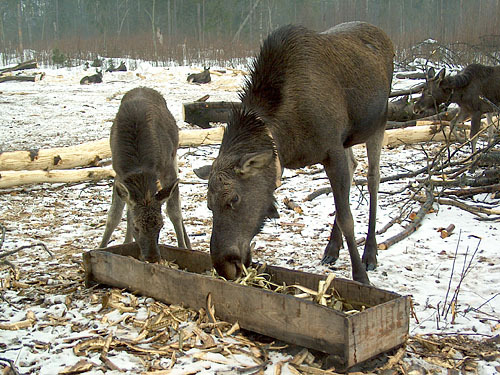 The oatmeal will become the main dainties for adult domestic moose for the rest of their lives. 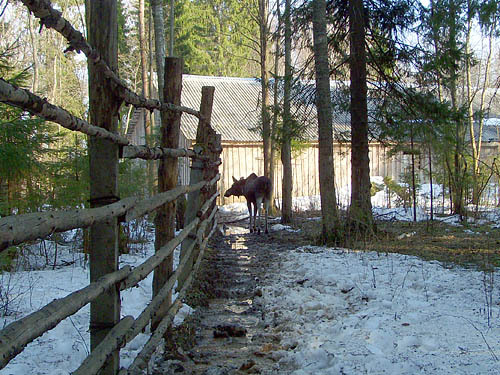 In winter, when the snow cover is deep enough, all the farm moose are led to a woodcut place several kilometers away from the farm. They all live together, eat from the same troughs and enjoy freedom. They are free except about an hour every morning. 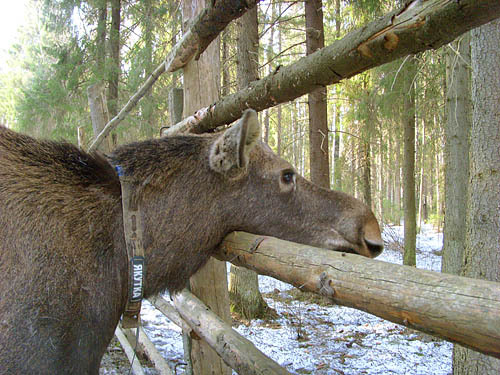 To prevent traumatism, during the time of wood logging no moose must be near working log-men. 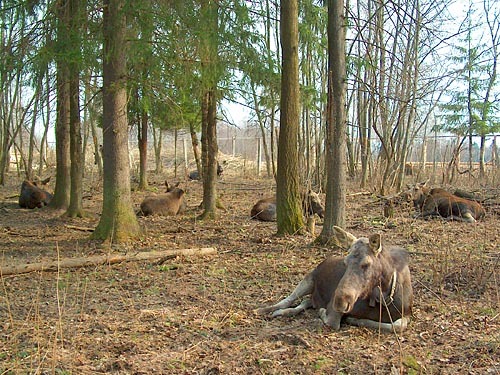 Noise and exhaust of chainsaws attract domestic moose because they expect fresh branches to eat and like to sniff petrol waste. Any heavy perfume attracts and excites them. 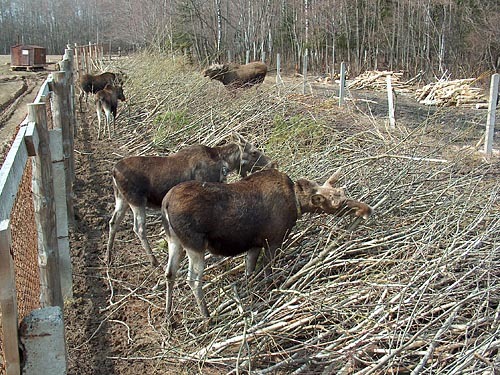 So, this hour every moose will spend in a small fence and eat a portion of oatmeal, then drink a bucket of salty warm water. 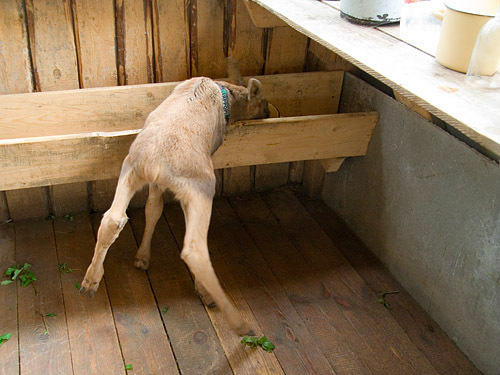 Separate sections are necessary to avoid conflicts between animals during food dispensation. This is how the farm obtains addition every year. In some years in 1980-s the number of newborn calves exceeded 30, in 2009 the farm got 21, and even this number exceeds the needs of remount. The reserved area can provide 10-15 adult milk moose cows, 1-3 males and remount, up to approximately 50 moose in whole, with natural food. More and more biological behavioral peculiarities of the species are used today in raising of a new generation and minimize both violence and freedom limitation. Perhaps, lack of funding thwarts development of violent methods. Farm animals were never «artificially selected» using any scientifically reasoned criteria. Now we don't see any behavioral difference between an orphaned calf brought from hunting ranges and a 6-7 generation calf born on the farm; both can be used in «milk and excursion» farming in the same way. That's why I say that moose species doesn't need any domestication at all and is a «ready» domestic animal if accurately trained (5). The manner of keeping this animal, however, differs from that of other domestic species because of peculiarities of digestion and need of multivarious food. Though farm animals are not subjected to artificial selection, they are subjected to almost natural selection. 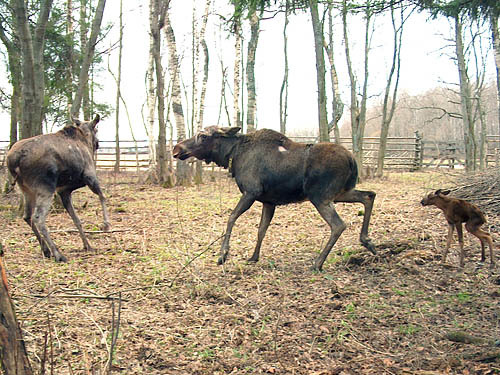 While young 1-3 years old moose are able to escape, only ones who want to live near humans will procreate on the farm. If this process will not be interrupted with transitory profit, in some more generations maybe we'll see some divergence between wild and domestic moose. 1. Богомолова Е.М. Лосиха и новорожденный лосенок - единая биорганизменная функциональная система //Физиологическая кибернетика Тезисы докладов I Всесоюзной конференции по физиологической кибернетике. - М., 1981. - С. 268-269. 2. Богомолова Е.М., Курочкин Ю.А. Роды у лосих. Поведение лосихи и новорожденного лосенка // Зоологический журнал. - 1984. - Т.63. - № II. - С. 1713-1724. 3. Богомолова Е.М., Курочкин Ю.А. Системогенез поведенческих актов. - В кн. «Теория системогенеза». - М.: "Горизонт", 1997, с. 277-453. 5. Минаев А. Н. (2003). Лось как домашнее животное. Агроэкологический вестник представительства всемирного союза охраны природы для СНГ, №5, июнь, стр. 17-19 См. в разделе «Библиотека».